SNP Announces Addition of Dr. Michael Joyce | SNP Inc.
SNP Inc. is excited to announce the hire of Dr. Michael Joyce as Special Projects Manager. Dr. Joyce received M.S. and Ph.D degrees in Paper and Printing Science from Western Michigan University, Kalamazoo, MI. After graduating from WMU, Dr. Joyce accepted a Post-Doctoral Scholar position in the Department of Forest and Biomaterials at NC State University. 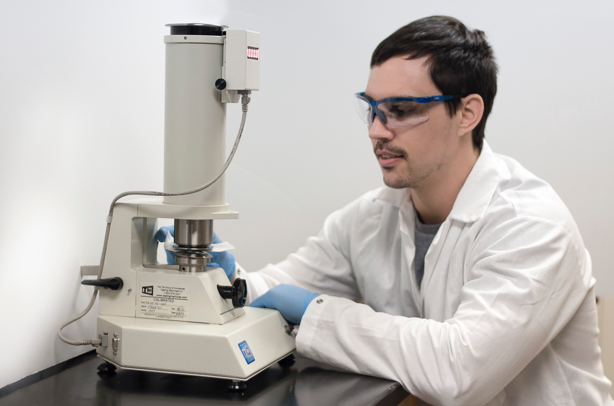 In this position, Dr. Joyce worked directly with Dr. Lokendra Pal on a grant awarded by the North Carolina Biotechnology Center (NCBC) to research the use of aqueous-based biopolymer materials as a replacement for extrusion coated thermoplastic resins. During his time at Western Michigan University Dr. Joyce worked on various client-supported projects through the Center for the Advancement of Printed Electronics and Center for Ink and Printability. Projects of focus incorporated screen, flexo, gravure and inkjet print methods. Through his work, a novel processing method enabling the creation of stand-alone printed sensors was created for which a patent was awarded. Dr. Joyce’s doctoral work focused on the study of metallic ink interactions with Polydimethylsiloxane (PDMS) substrates for creation of biocompatible printed sensors. Dr. Joyce looks forward to sharing his expertise in printing and biopolymers to expand the SNP natural product line and further SNPs service to its customers.